working community group aim to have a third unit in place within the next two years. Kenmare AED was formed following the public support received by the SOAK Group and the successful achievement of Kenmare’s goal to retain a 24/7 Ambulance Station in Kenmare. Rather than disperse the group entirely following that success, some of the volunteers pushed ahead to form Kenmare AED Group with the help of other like minded people in the community. “The importance of training cannot be stressed enough,” said Billy Bevan, Secretary of Kenmare AED Group. “CPR is an easy skill to learn and we think there should be a minimum of two qualified persons in every establishment in Kenmare, ideally two per shift. Members of Kenmare AED Group are extremely grateful for the pledges of support from local people and businesses in the town who make their premises available for training, promotion and general sponsorship, which has really helped galvanise community effort for what is, quite literally, a lifesaving cause. “The members of Kenmare AED Group are very grateful for the pledges of support already received. Any form of support, either by financial contribution or participation, is a very welcome boost to our cause,” concluded Billy. 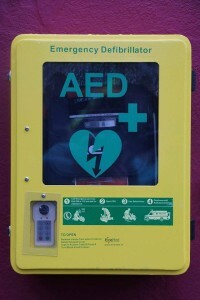 training for AED can contact kenmare.aed@gmail.com.